We recently wrote a post describing the process of attaching a level banister handrail between walls with rosettes. The alternative to that process is to use rail bolts. This post is not intended to explain how to use rail bolts but instead to describe a simple trick for using them when the rail will be attached between two walls or posts. The “problem” that arises when using rail bolts on both ends of a level balustrade is that it appears there is no way to get the rail in place when the rail bolts have been screwed into the walls on either side. Thus the purpose of this post. The “trick of the trade” is to notch out the bottom/end of the handrail on one end which allows the rail to drop over its corresponding rail bolt. Basically, just before you are ready to install the handrail after it has been cut to length and drilled for a rail bolt installation, you take a sharp chisel and a hammer and remove a channel for the rail bolt to drop over. Place the sharpened chisel on the end of the handrail as shown in RED and by gently tapping it with a hammer split the grain. This will allow the angled “keyhole” piece to be temporarily removed. Then install the handrail as normal, placing the un-chiselled end over the rail bolt, and working down on top of the balusters toward the keyholed end. 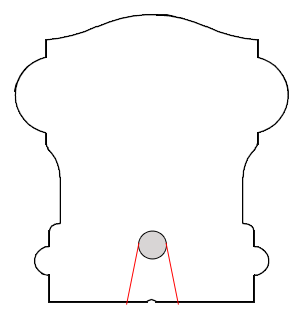 Once the rail is down on the balusters, the rail bolt on the keyholed end should be in the center of the ½” hole. As long as you have calculated correctly 😉 Next, carefully apply wood glue to the keyholed piece, replace it, and clamp it in place. Its wedge shape will ensure that it stops flush with the bottom of the rail. Make sure that you replace the piece in its exact place and that you take care not to damage the handrail with the clamp. Let the glue fully dry then add the washer and nut and tighten down securely with your rail bolt wrench. Finally, plug the 1” hole with a 1” face grain plug, sand it flush and your installation is complete. This procedure can be done for floor level balustrades between walls, posts or one of each. Good luck!